Five men have been arrested in Sefton and Liverpool during raids linked to a suspected £100,000 tax fraud involving smuggled cigarettes, an illegal vodka factory and tax credits fraud. HM Revenue and Customs (HMRC) visited several address across Liverpool and Sefton, on Tuesday (October 3) as part of an ongoing investigation into previous seizures of illicit cigarettes and fake vodka in the region, as well as associated money laundering. Officers also discovered and dismantled a fake vodka bottling plant in July this year in Aintree. discovered a suspected amphetamine laboratory at one address. “We will continue to act to disrupt suspected criminal activity. This investigation is still at an early stage but shows the spectrum of suspected crimes that can be uncovered in one enquiry. HMRC will work closely with our partners to ensure there is no further risk to public health or the public purse from these suspected activities. In March 2017, HMRC seized 199,780 suspected counterfeit Mayfair King cigarettes in the Aintree area, which was worth £56,138.68 in evaded Excise Duty and VAT. In July 2017, a fake vodka bottling plant in Aintree was dismantled and bottleslabelled as No 01 Imperial Vodka Blue were seized. It was worth an estimated £45,000 in unpaid Excise Duty. Subsequent chemical tests found the alcohol, although not toxic, contained compounds that should not be present in vodka. Prior to the arrests, HMRC officers also uncovered a suspected substantial tax credit fraud. HMRC called in Merseyside Police and Merseyside Fire Brigade to deal with the chemicals at the suspected drugs factory. Merseyside Police, in partnership with Sefton Safer Communities Partnership, will be handing out DNA marking security kits in Sefton this weekend, as a continued response to the theft and anti-social use of scooters, motorbikes and mopeds in the area. The kits are police approved and allow owners to mark and protect their vehicle. “We agreed to fund these security kits to help assist Merseyside Police in targeting those criminals who continue to blight our thriving communities by stealing motorbikes, scrambler bikes and mopeds and using them in an anti-social manner. “Theft and anti-social behaviour involving bikes will not be tolerated, and this is another great crime prevention tool for owners. If anyone has any information about the anti-social and criminal use or storage of motorbikes or leave information anonymously with Crimestoppers on 0800 555 111. Information can also be provided via their online form: https://crimestoppers-uk.org/give-information/give-information-online. Liverpool Coroner’s Office is appealing for the public’s help in tracing the next of kin of a man who recently passed away in Bootle. Alexander Aitchison, aged 49, died on Tuesday, 26 September at his home address in Orrell Lane. There are no suspicious circumstances surrounding Mr Aitchison’s death. Pupils from schools across South Sefton have been shown how to have fun without dangerous scrambler bikes, thanks to Sefton Council and Merseyside Police. 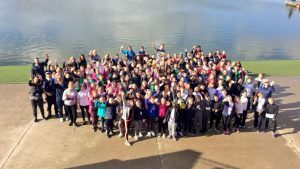 Hundreds of schoolchildren from All Saints, Lander Road, The Grange, English Martyrs and Hatton Hill donned their gym kits and took part in an exhilarating inter-school sports day at Crosby Lakeside recently. This is the second sports day by Sefton Council and Merseyside Police, designed to highlight the effects scrambler bikes have on local communities and how children can have tons of fun away from the dangerous bikes. As well as learning about the vehicles, children took part in a host of activities including raft building, bush craft, archery, orienteering, teamwork and problem solving. Cllr Trish Hardy, Sefton Council’s cabinet member for Communities and Housing said: “This was a fantastic day out for all involved. “Around 160 schoolchildren took part in the day and our partnership with Merseyside Police is working extremely well to highlight the dangers associated with scrambler bikes and how they can affect local communities. 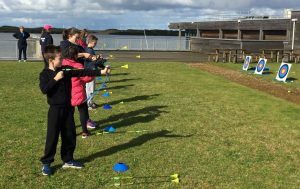 “By getting involved in the campaign we hope all the young people have learned some valuable lessons and they have now been rewarded with a great day out using our amazing facilities at Crosby Lakeside. “Next the schoolchildren will be taking part in a competition where they have been asked to make a 90 second video about the dangers of becoming involved in scrambler bike activity. Sefton Neighbourhood Inspector Ian Jones said: “Education and engagement is such an important part of the work we do alongside Sefton Council and our other partners. This inter-school sports day is a brilliant way for children to channel their energy and creativity in a positive way. “During our yearly scrambler bike initiative, we not only want to show young people the serious dangers and nuisance that scrambler bikes cause across the community, but also encourage them to learn different activities, skills and pursuits. Police are searching the Sefton stretch of the Leeds-Liverpool Canal path as they continue to target criminals using open land to store weapons and other items. Officers from the Liverpool Targeted Team completed an open land search of the canal covering Lydiate yesterday, Monday 25 September. During the search, a 26-year-old man from Netherton was sighted on the canal path near to St Oswalds Lane in Bootle and rode off on a pedal cycle. Officers gave chase and recovered a set of bolt cutters. The man was arrested on suspicion of theft of a pedal cycle and going equipped for theft. He was questioned and has been released under investigation for further enquiries. Inspector Dave Brennan said: “We will continue to be proactive in combating weapons and other items being stored in open spaces on Merseyside, both to protect the community and raise people’s awareness. “Anyone who uses the canal path or any open land and green spaces in Merseyside should be alert to people behaving suspiciously and storing items in these areas.